Youth and education: $7 million supported organizations and schools providing in- and out-of-school programs for early childhood education as well as college access programs, including $5 million to the University of Minnesota to fund environmental sustainability research and education through academic leadership, scholarships and research at the university’s Institute on the Environment. Civic and community development: $4 million funding supported organizations that provide basic needs to vulnerable citizens, including access to food and housing, and job training. Arts and culture: $735,000 supported performing arts and arts education organizations and their involvement in schools. Environment and conservation: more than $650,000 of 2018 grand funding supported organizations that help protect our lands and waters as well as those who educate our youth about nature and conservationism. Across all four focus areas, $940,000 was designated to grants focused on youth science, technology, engineering and mathematics (STEM) education. In addition, grants exceeding $1 million were also made to 26 United Way chapters in the U.S., matching employee donations in these communities. 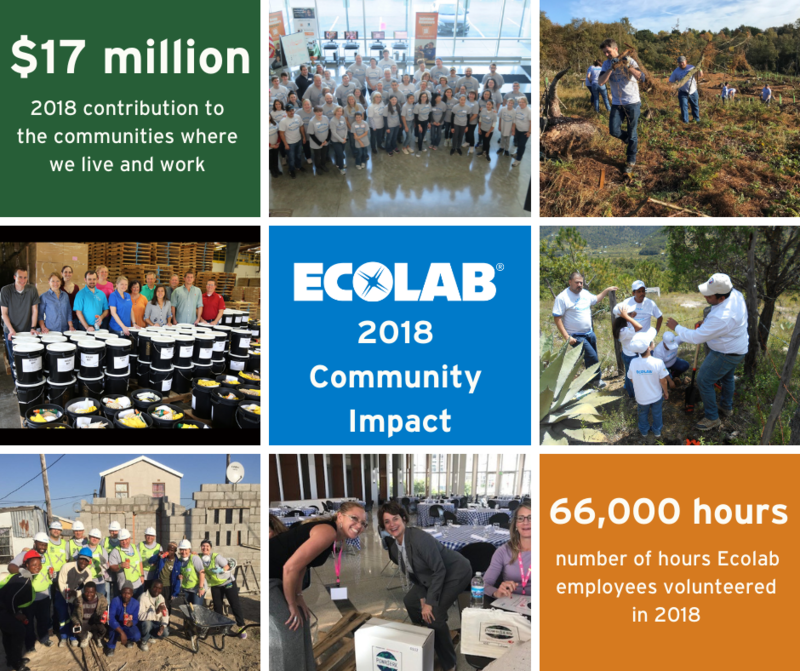 In 2018, Ecolab also continued support for its global philanthropic partners, The Nature Conservancy and Project WET, through the company’s Solutions for Life program, which enhances Ecolab’s mission to conserve water and improve hygiene throughout the world. Through Project WET, more than 7 million people in 88 countries have been reached through the Clean and Conserve Education Program, a free curriculum co-created by Ecolab and Project WET to educate youth about water conservation and healthy hygiene practices. In 2018, Ecolab also committed to a three-year sponsorship of Project WET’s DiscoverWater.org to help students in upper elementary and middle school learn about the water cycle, water conservation, healthy hydration and soap and water science. The continued partnership with The Nature Conservancy resulted in water conservation work in Minnesota to help protect the headwaters of the Mississippi River and support the development of water funds in China to help protect the Dongjiang River Basin and Qiandao Lake in Zhejiang Province. The partnership also helped fund a tree nursery in Mexico that will provide 500,000 pine tree saplings annually for reforestation in and near the Cumbres de Monterrey National Forest. In partnership with World Emergency Relief and Good360, Ecolab donated $1.5 million of cleaning, sanitizing and public health products to support disaster relief. Ecolab products were distributed in support of disaster relief and other initiatives to 10 states in the U.S. and to those in need in Belize, El Salvador, Guatemala, Guyana, Haiti, Honduras, Indonesia, Jamaica, Mexico, Moldova and Puerto Rico. Volunteerism is a core component of Ecolab’s culture, and in 2018, employees volunteered more than 66,000 hours, providing a value of nearly $2 million* to their local communities (*average calculation from the Independent Sector).